Making good coffee is a necessity while enjoying the outdoors. Snow Peak applied its superb titanium construction to the Titanium Café Press. This press weighs only 6.3 oz. is perfect for backpacking when packed in its case. 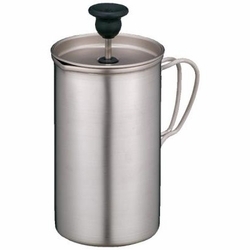 No need to suffer instant coffee while camping or hiking, pack your Titanium Cafe Press for excellent coffee outdoors.